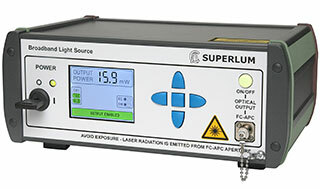 ﻿ Superlum | Products | Broadband Light Sources | M-S-series BroadLighters. Benchtop Broadband Light Sources. Products --> Broadband Light Sources --> M-S-series BroadLighters. Benchtop Broadband Light Sources. M-S-series BroadLighters. Benchtop Broadband Light Sources. Superlum M-S-series BroadLighters, the second generation of our S-series BroadLighter light sources, are high-power, very wide spectrum and low coherence AC powered benchtop light sources based on a single mode fiber coupled superluminescent diode modules (SLDs) of Superlum. Superlum offers two types of M-S BroadLighters, namely, with and without a Variable Optical Attenuator (VOA). The former has the suffix "-VA" in the model number. In both designs, output power is changeable within 0–100% with the step of 10%. Spectral performance is guaranteed at the full (100%) output power. In M-S-series light sources without VOAs, the optical output power is changed by varying the SLD drive current, entailing a change in the shape of the SLD spectrum. The change is not significant for models with a bell-shaped spectrum but may be large for models with a complex, multi-humped spectrum (see the examples below). Spectrum of BroadLighter M-S-795-G-I-15. Left – optical spectrum at output levels: 100% (20 mW SMF, black line); 50% (10 mW SMF, blue line); 10% (2 mW SMF, red line). Right – same but normalized: 100% (black line); 10% (red line). Spectrum of BroadLighter M-S-840-B-I-15. Left – optical spectrum at output levels: 100% (20 mW SMF, black line); 50% (10 mW SMF, blue line); 10% (2 mW SMF, red line). Right – same but normalized: 100% (black line); 10% (red line). In M-S-series BroadLighters with VOAs, SLD itself always emits 100% of its power. The output power is changed with the help of a broadband VOA that is placed after the SLD module and the optical isolator. For these BroadLighters, changes of optical spectrum with output power are negligible (see the example below). As a rule, Superlum offers M-S-series light sources with VOAs when the light source is based on an SLD with multi-humped spectrum. However, M-S-series devices with VOAs and SLDs with bell-shaped spectrum are available upon request. M-S-series light sources with VOAs are recommended for applications requiring changeable output power but stable spectral shape and center wavelength. Spectrum of BroadLighter M-S-840-B-I-15-VA. Left – optical spectrum at output levels: 100% (15 mW SMF, black line); 50% (7.5 mW SMF, blue line); 10% (1.5 mW SMF, red line). Right – same but normalized: 100% (black line); 10% (red line). All standard light sources have an appropriate built-in optical isolator to protect the SLD from optical feedback. Key parameters of standard models are listed in the table below. The optical spectrum and the coherence function can be viewed as a web page (HTML) or downloaded in PDF format. – bell-shaped spectrum, – multi-humped spectrum. Overall dimensions (W × H × D): 251 × 112 × 192 mm (9.88 × 4.41 × 7.56 inches). 100-240 V AC, 50/60 Hz, 40 VA MAX. Superlum offers product customization services. A number of the operating characteristics of the M-S-series light sources (e.g. the output power level, center wavelength, spectrum width etc.) may be modified to meet your specific requirements. The most of High-Power SLDs of Superlum are Class 3B according to IEC/EN 60825-1:2014. All M-S-series BroadLighter light sources are equipped by the master key control, remote interlock connection, visual/audible alarm, informational warning stickers, etc. Download Technical Product Specification in PDF format (191 KB) .